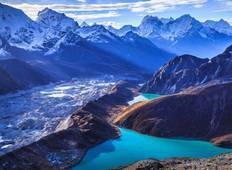 Find the right tour for you through Gokyo Ri. 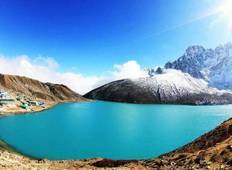 We've got 41 tours going to Gokyo Ri, starting from just 10 days in length, and the longest tour is 26 days. The most popular month to go is April, which has the most number of tour departures. "Unfortunately the review site does not show any stars for the guide rating. But if..."
"Hari is a professional guide that stops at nothi g to make your trek adventure exciting,..."
"We had the most momentous trekking with Nepal Trekking Routes Treks & Expedition...."
"Me and my brother went to Everest base camp using Scenic Nepal treks, it was a great..."
"The Everest High Passes Trek is a challenging and extremely rewarding trek with breathtaking..."
"Great experience with a fantastic guide Dewan. Very easy company to deal with at..."
"“We were a pair, that just finished the Gokyo trip. The experience was amazing,..."
"Where to start? Great level of communication from Indira before arrival in Nepal;..."
"Hari was just a wonderful nice guide who really made the trip even more beautiful...."
"5 of us in our group from Kuching, Malaysia have completed the Everest Base Camp..."
"This trek was very challenging but empowering. Nimesh our guide was very knowledgable,..."